My friend, Tyler, and I have been talking about doing a golden mile drinking route sometime. He had planned to visit Colorado this summer, so I got to work on looking into it and decided Estes Park is suitable for a golden mile of twelve alcohol serving establishments. There are plenty of original eating and drinking places peppered on or near the main drag of Elkhorn Avenue. Tyler arrived August 6th and stayed until just this last Monday, the 25th. It took weeks of resourcing information from different mediums, but we planned and successfully executed the Estes Park Golden Mile. Our idea of the golden mile sprang from “The World’s End” film starring Simon Pegg and Nick Frost. Sadly we didn’t run into any dramatic hazards from their adventure but we did manage to meet some good people along the way. I will now list the official order of the EPGM. This golden mile order was executed Friday August 22, 2014. There is a handful of other notable establishments in the EP area, but they are not part of the EPGM because of distance. I would have possibly included places like Cable’s Pub, Taphouse, Tiki Bar, and even Aspen Lodge or Baldpate Inn if they had met distance requirements or opened when they said they would (Tiki Bar). But these places stand alone as unique as the others. I recommend checking them out. We began preparation for this feat on the previous day by eating mineral and fiber rich meals with adequate carbohydrates. We also did not have a drop of alcohol that day. Tyler had already been here a couple weeks getting acclimated to the elevation. 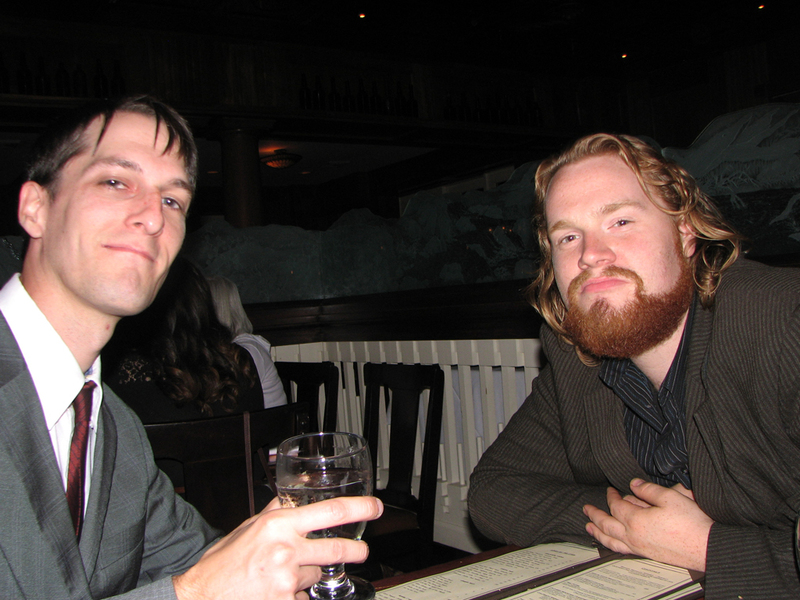 We had also been drinking a bit every day. This is important to train your body so you won’t get hammered too soon on the day of the golden mile. We also visited an ATM and withdrew the cash for twelve beers and plenty of food. It’s about a hundred dollars; small bills are preferable because you can just throw down and walk. On the morning of the golden mile we got up early and had smoothies for breakfast. One smoothie consists of: many frozen blueberries, half a banana, 1 egg, 1 scp. Ruby Red powder, 1 scp. SuperGreens powder, 1/2 tsp. cinnamon, 1 tsp. camu camu powder, 1 tbsp. cocoa powder, local honey, then fill with unsweetened almond milk. The Magic Bullet blender and one of their standard containers was used for making this smoothie. Proportions match the container and preference. This was a nearly perfect beginning for a day of drinking and walking. 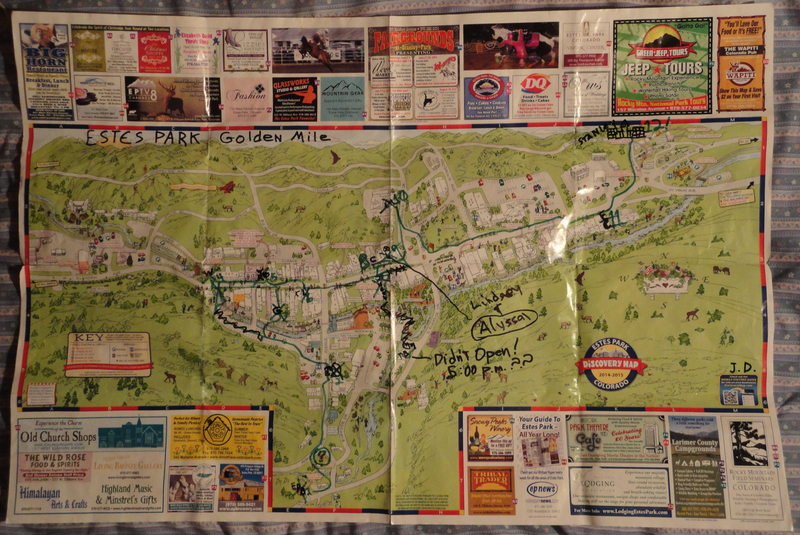 There is no actual pub guide / map, as I understand it, so this is what we had to work with. 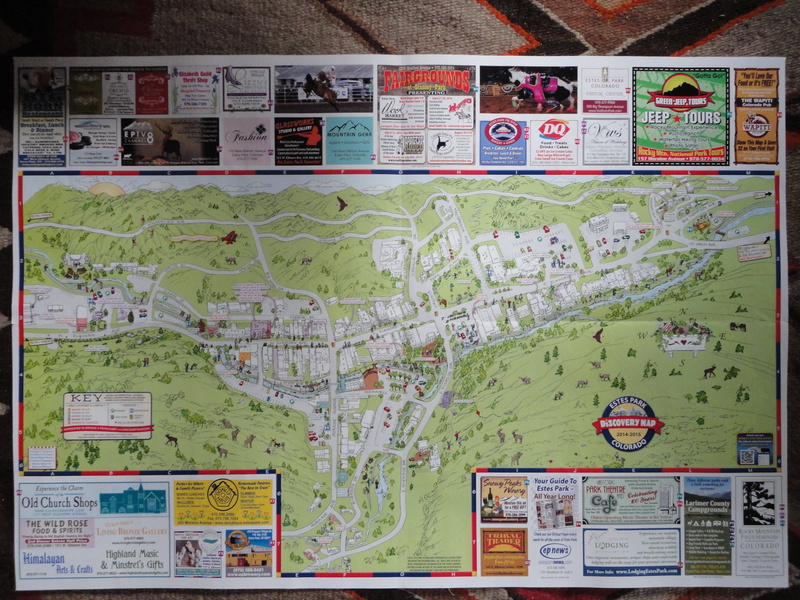 It’s kind of odd for a town with more bars than fingers and toes to not have a bar guide, but we made the Estes Park Discovery Map work. 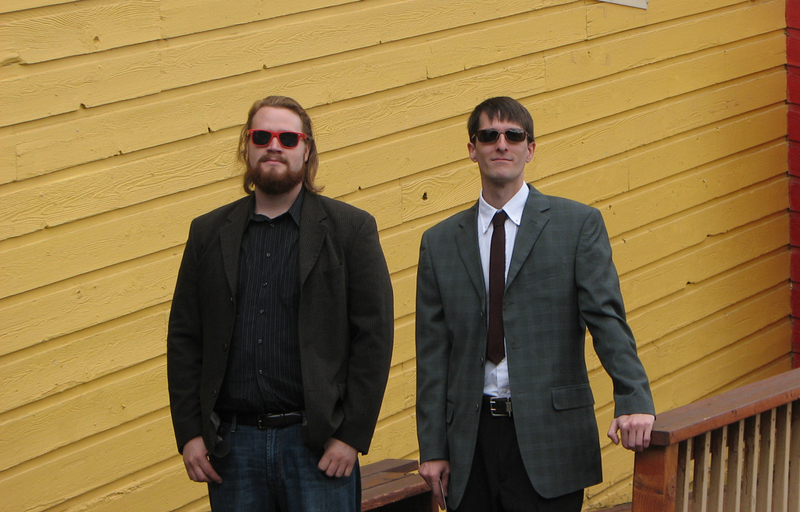 After dressing to the nines we grabbed our EPDM and markers then secured a ride to the first location; The Estes Park Brewery. We arrived at 11:30, just before lunch, and walked right upstairs to the bar. We ordered two pints of the gold; this was our Best of the Rockies “go to” ale for the day. It’s an excellent golden ale on the lower end of bitterness. The rule of the golden mile is to order a pint draft anywhere you can. Otherwise, go with what they got. The next stop was the Molly B. It’s a modest little bar with a bit of character. They only had bottles but we had another EPB beer. The actual bar area is tiny but it looks nice. The beers went down smooth and we chatted a little bit with the women that were working there. It’s almost like everyone working in Estes Park isn’t from Estes Park. Pleasantly odd. By now we were getting a bit hungry, so we walked across the street and over the river to Grubsteak. They have a magnificent bar. We ordered a couple of pints of something quite good they had on tap. Seeing as how it’s also a damn fine eatery, we started thumbing through the menu. We intended to order fries and cheese sticks but after informing the bartender of our mission to craft a golden route through town, he proceeded to advise us in properly eating for the task. So we 86’d the frozen cheese sticks, and went with some scotch eggs he was nice enough to inform us about. All I can say is, “YES, HOT DAMN!”. The scotch eggs at Grubsteak are Legendary. Someone knows what they’re doing with those little devils. The small meal had renewed my faith toward the endeavor. We were ready to tackle the remaining establishments. We walked on up to the Wapiti Pub. I was impressed with their environment. It’s a medium size bar and they seem to rotate the taps through a lot of different brews. We ordered a couple of Golds and that floated the keg, so she brought us those half pints at no charge. We sampled a citrusy beer and decided to go with two pints of that. It was quite busy in there for the time of day, but most of these establishments are original and Estes is a tourism hot spot. I enjoyed the Wapiti. Aside from the other patrons, it feels like a private basement bar. The next stop was the Wild Rose, and by now we’ve worked up a strong appetite. The picnic food was pleasant at Grubsteak, but I think we were both in need of a meal by now. I ordered a club sandwich and washed it down with a water and a bottle of fine beer. I’m pretty sure Tyler ordered the Reuben, but the best one he’s had was at Local’s the previous day. The Wild Rose is pretty much a dining restaurant, but they have a micro bar, so they qualify. We crossed the street and walked down to Lonigan’s Pub. If it’s good enough for a bear, it’s good enough for anyone. This bar just bleeds of history. Lonigan’s has that dim hometown pub atmosphere. I like it. It reminds me there are plenty of interesting places to discover. We threw back a couple pints of something and watched as horrific events flashed on televisions. We thought of including Kelli’s Lounge somewhere in the golden mile but everyone kept telling us to keep clear of that place. I guess it’s just for hipsters or young yuppies or something. So we accepted the professional advice and excluded Kelli’s Lounge from the golden mile. Besides, who wants to pay a cover just to have a drink? We didn’t. Crossing over Moraine Avenue, we ventured down to The Wheel Bar. I can’t say enough about this bar. Every time I’ve visited, it’s been quite populated and last Friday was certainly no exception. I’m not sure but I think we ordered a couple pints of Gold. It didn’t matter, they were gone in short order. We might as well have been drinking acid, we had lead bellies by now. We were just over half way and there was no way we were stopping. We walked out the south entrance and over the river and across the parking lot toward the Tiki Bar. They had a sign on the door that said they were opening at 5 p.m. They didn’t. It’s just like a small town family business to not open when they say. We gave them ample time, and I even phoned their numbers and left them a message. We eventually said to Hell with them and excluded them from the EPGM. We decided to replace them with Local’s Grill, and I’m glad we did, but I’ll get to that shortly. So we head back up and across Elkhorn Avenue to número ocho, Chelito’s. I like this place. I’ve eaten at Chelito’s thrice before and it’s always been fun. Climbing up to the third floor is a bit of a challenge after seven beers, but taking the elevator would have seemed cheap. We sat outside in the balcony area, but it had just rained earlier so we sat under the eaves of the building. The person tending to our table (I can’t recall now if it was a man or woman) brought out chips and salsa and we ordered our beers. I ordered a Negra Modelo and Tyler may have ordered a Dos Equis. I was feeling just right. I knew at this point, we were going to finish this endeavor. We paid in some form or another and I might have felt a little guilty about chomping on the chips without ordering food, but I think I tipped well. It was a short walk to Local’s and we we’re doing very well with our time. We were seated in a booth and ordered a couple of their house bottle beer, with mugs. It’s basically the EPB Gold but they put their own label on it. We must have begun getting loud because we attracted the attention of the two young waitresses, Alyssa and Lindsay. I hope I’m spelling their names correctly because there are a few variations on both of their monikers. They were pretty and interested in what we were doing, so we told them about the golden mile we were designing. 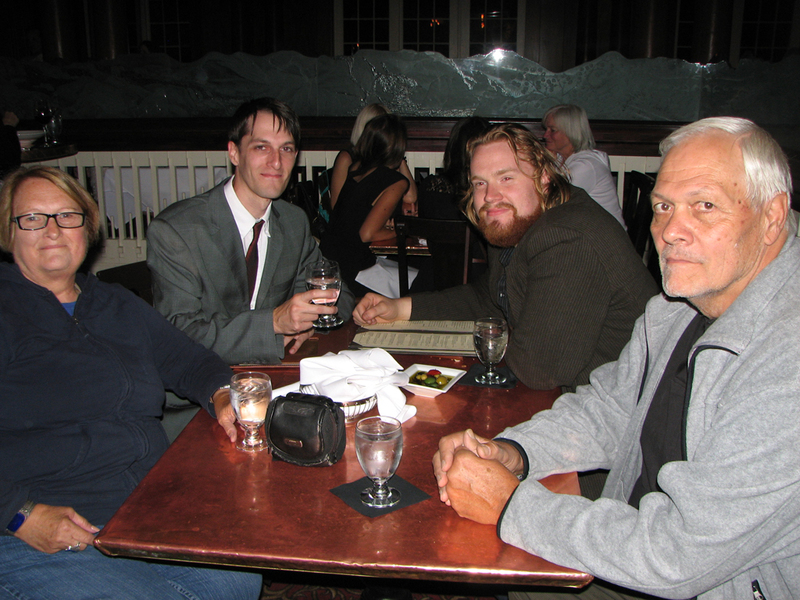 I don’t recall eating at Local’s that night, but we sampled their menu the previous week during the research phase. I gave them my card with this address, we paid and headed on down the road. Número diez was La Hacienda. This restaurant & bar overlooks Virginia Dr., with possibly a view of Bond Park, but it was much more happening a place inside than on their balcony at this hour. We sat at a table in the center of the room in front of the bar, surrounded by conversing families and the clanging and scraping of utensils. It was a happy experience. We both ordered large drafts of Dos Equis Amber. I didn’t think it would be “tha big one” but when they arrived, I realized it was a 24 ounce mug of beer. Either way, it was a pleasing experience to slowly empty it. It assisted in making up for the missing 4 ounces from all those previous bottled beers. The sound of people eating in high spirits got me hungry again and I ordered a huge plate of rice. Tyler possibly ordered something that was most certainly dead. I mean, it may have been some sort of meat dish, but I can’t quite recall. The sky was now beginning to actually darken, so we got supercharged about nearing the finish and got up to pay. I attempted to speak in español with an employee about our quest and the golden mile, but I quickly realized he either didn’t care or I was a babbling fool. We exited stage left and proceeded onward. The walk from La Hacienda to Ed’s Cantina is the second longest walk of the EPGM; the most taxing is the final walk up the hill to the Stanley Hotel. We enter the Cantina and are seated at a table in the bar area. The memory of this place is kind of a blur now, but I’m sure that has something to do with the neon glow lighting, and my contacts probably could have used some hydration. My vision may literally have been blurred. Certainly the eleventh pint I was about to drink had nothing to do with it (ha ha). I don’t know what I ordered but it was probably an IPA because I remember some bitterness, and I do like to try different IPA’s. I remember asking our waitress to help in the marking on the map of the Cantina’s location. I knew where it was but I was really just trying to make her a part of a minor ceremony. It was busy and there wasn’t much time to explain anything, so I abandoned plans for any further conversation. We were periodically marking up the discovery map throughout the day, and it often drew some attention; all good. The combination of colors, lights and noise in Ed’s Cantina placed me into a haze of wonderment. I felt compelled to finish as early as possible. I called our ride (my parental units) and informed them we were beginning the walk up to the Stanley Hotel. It was just past 8 o’clock and we were going to finish early; we had done very well. I don’t remember crossing the street but we most likely didn’t use a crosswalk. However, I don’t recall much traffic at that time. We burned some time hiking up the street toward the Stanley. It was a majestic sight. It was glowing through its windows and well lit for all to see. It is truly a World’s End class bar. The Stanley Hotel portico is a ranch style entrance of white pillars and railings. The doors open into a foyer of select choices of beautifully finished species of wood. It’s big, but not too big. It’s more cozy than anything else. The Cascades Restaurant and Whiskey Bar is to the left. There are two ladies standing at a thin podium just outside the entrance of our final destination. A look inside tells me this is the most populated bar I’ve seen all day. Perhaps it is just the later hour. I feel like I kind of cheated my way inside because I informed the two ladies we were just wanting to go to the bar for drinks. But upon entering the area there is hardly a manner to even see a bartender, let alone talk to one. We turn around and see a low table that seems to have been recently cleared off. It’s the only empty four-seating table in the area near the bar that can be seen. We shuffle through some elbows and promptly sit down at it. Tyler stayed at the table while I headed out to the foyer to wait for the parental units. I sat back in a plush chair and soaked in the scenery. After some time, the parental units arrived at 8:50 and I ushered them to our table. Tyler and I ordered some pints of our final EPB labeled beer and I also requested a glass of this medium-priced fine whiskey our server recommended. I didn’t think it proper to enter a world class whiskey bar to order a simple beer. We had a good time. Tyler and I did make it up to the fourth floor of the Stanley Hotel after leaving the whiskey bar and I’m pretty sure something weird is going on up there. On the third floor or so, I saw a warped mirror or something like an old mirror at the end of a hall, but it didn’t reflect people, so it may have been a clever painting. I don’t know, I was drunk. As we were leaving out the rear portico to the parking lot, I viewed a couple looking out over the lot from a balcony and talking. We somewhat yelled out to them about the weird happenings of the 4th floor and that the place was haunted. They waved. It was 10:08 p.m. when we climbed into the rover. That concludes the Estes Park Golden Mile. I hope you enjoyed my reporting of this quest, and perhaps you will plan to accomplish it someday. That is what the discovery map looks like now. As you can see it’s a bit tattered by being handled by two drunks for a day. It has also acquired a couple more folds; it was absolutely necessary for the cause. It’s getting framed. Now for some additional “day after” information. I can’t say enough about quality liquors. The alcohol really took effect upon returning to the cabin. So I drank enough water to drown a dog and repeatedly had to use the lavatory the rest of the night, but I didn’t get sick. At about 4:00 a.m. I awoke to several spinning sensations, so I fumbled my way to the kitchen to eat half a banana and imbibe more water. I rested in the lavatory a bit and went back upstairs to bed. Later that Saturday, I was pretty much useless so I continued sipping water and played some GTA V. Tyler seemed better off than me. I blame Canada.